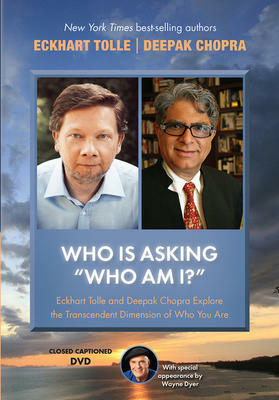 Inspiration, Recovery & Self-Help> Great Inspirational Teachers> Deepak Chopra> Who Is Asking 'Who Am I?" Who Is Asking 'Who Am I?" Filmed in Carlsbad, California, at the Chopra Center's 'Seduction of Spirit' retreat on April 23, 2013, this inspiring video captures the historic evening that master teachers Eckhart Tolle and Deepak Chopra shared the stage for the very first time. Over the course of two hours, these world leaders in awakened thought cover such profound topics as mindfulness, how to fully engage with the present moment, thought's ability to infect the mind like a virus, the difference between a thought-based entity and a presence-based entity, the five ancient causes at the root of all our suffering, and how to identify with our true self and not simply our self-image. Their wise words can help us to step back from our thoughts and experience the transcendent moment where we recognize the impersonal self within us - the self beyond ego that touches and is one with the totality of the universe. Eckhart and Deepak each open with a 30-minute solo talk before appearing together for a 30-minute Q&A based on burning questions submitted by their online communities. The evening concludes with a special appearance by fellow personal transformation expert Wayne Dyer, who joins both Eckhart and Deepak on stage to discuss divine love-the fundamental energy flowing through all things. Join this unprecedented meeting of the minds and deepen your understanding of the mind-body-spirit connection and the formless presence of consciousness itself in ways achievable only through the guidance of such esteemed teachers.